One of the Ranown westerns based in a town, like Decision at Sundown, instead of being shot out in the Lone Pine countryside. Agry Town, on the California-Mexico border, is corrupt, like Sundown. The genial Texan Buchanan rides in from Mexico and has trouble riding out. The sheriff, the judge and the hotel keeper are all brothers named Agry, with a son of the judge as a short-lived trouble-maker. That seems to make four Agrys. 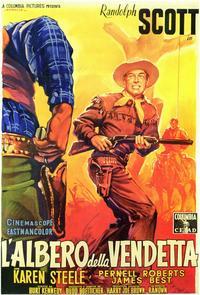 In a saloon, Juan de la Vega (Manuel Rojas), a wealthy young Mexican seeking revenge, kills Roy Agry, son of Judge Simon Agry. Buchanan helps him as the sheriff’s men proceed to beat him, and both land in jail, Buchanan with his $2000 from his years in Mexico confiscated. 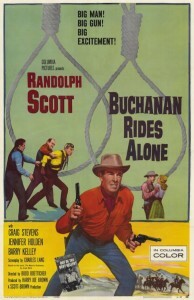 As matters play out, Buchanan is sent out from town in the company of two deputies who obviously have instructions to kill him. 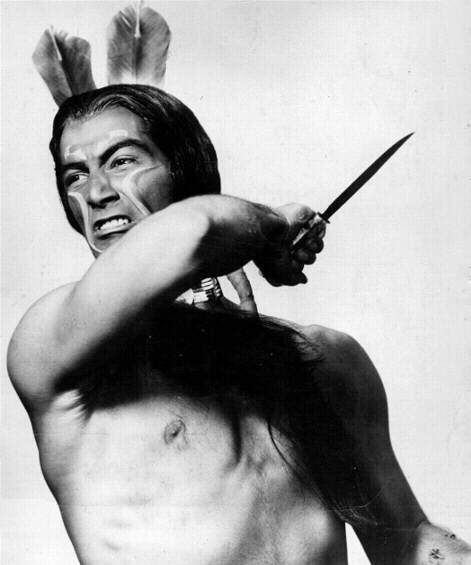 One of them, Pecos Hill, upon finding that Buchanan is a fellow West Texan, turns on the other and kills him. Buchanan is released and they hold a non-stereotypical impromptu funeral for the deceased gunman. 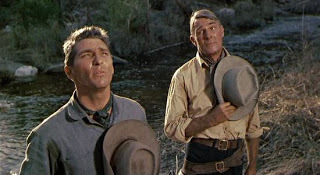 Pecos has a speech in which he declares that his deceased friend was a cheater and a thief who couldn’t be trusted, but otherwise was not a bad guy. Pecos (L.Q. 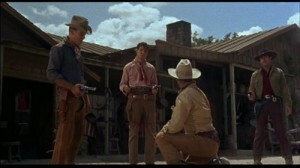 Jones) delivers an impromptu funeral soliloquy, while Buchanan (Randolph Scott) looks on. The three senior Agrys are all conspiring against each other. Judge Simon is the most powerful, and has his own gunman, Abe Carbo (Craig Stevens). Sheriff Lew Agry has several deputies. And hotel keeper Amos Agry is playing one against the other for his own advantage. Simon keeps trying to extract a $50,000 ransom from Juan’s family, while Luke wants to get the money and hang Juan, too. Amos wants a cut of the money. Juan escapes and is recaptured; Buchanan is released and recaptured. After several reverses, all the players end up at the border scrabbling over the $50,000. The Agrys are on the U.S. side, and Juan and Buchanan are on the Mexican side. The money is on the bridge in the middle, and there is a stand-off. Lew sends Simon to get the money and then shoots him while he’s on the bridge. Lew then gets shot in turn. With the two effective Agrys dead, Buchanan gets most of his $2000 back and then hands the $50,000 to Juan and the town over to Carbo. This is based on the 1956 novel The Name’s Buchanan by Jonas Ward. 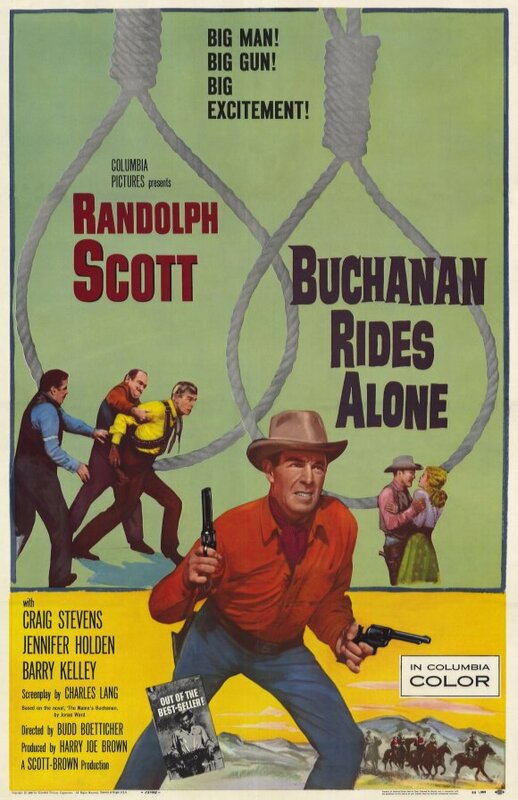 The writing credit for this one is attributed to Charles Lang (as is Decision at Sundown), and Randolph Scott as Buchanan is talkier than in Burt Kennedy’s scripts, with more humor. 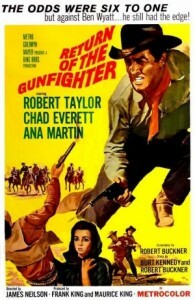 However, Boetticher later confirmed that he found the Lang script unsuitable and had Burt Kennedy re-write it. Since Lang’s wife was gravely ill and they needed the money, Kennedy generously allowed the writing credit (and the fee) to stay with Lang. Still, it’s not really Kennedy’s best work as a writer. 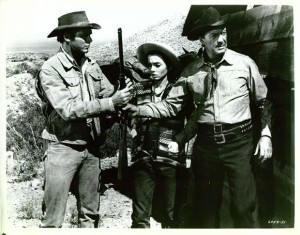 Buchanan (Scott), Carbo (Craig Stevens) and a nameless horse. Interestingly enough, there is no significant female role in this film, not even for Karen Steele (the statuesque Mrs. Boetticher). 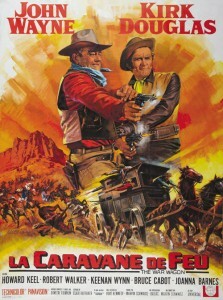 Television private eye Craig Stevens (“Peter Gunn”) plays Carbo, Simon’s hired gunman who always rides in a carriage. 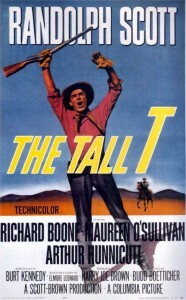 Stevens gets second billing, but his character isn’t very developed. There is an early screen appearance by L.Q. Jones as the chatty young Texan Pecos Hill. 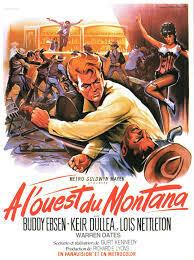 This is not one of the more highly-regarded Boetticher-Scott efforts, but it’s enjoyable enough to watch. Cinematography is in color by Lucien Ballard. 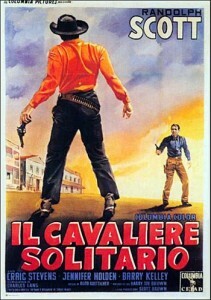 Like all the other Ranown westerns, this is fairly short, at 78 minutes. Filmed in Old Tucson-Sabino Canyon, in Arizona, not at Lone Pine like most of the other Ranown series. So, although it’s the only one of the Ranown films to be set in California, it’s the only one not to be filmed in California. 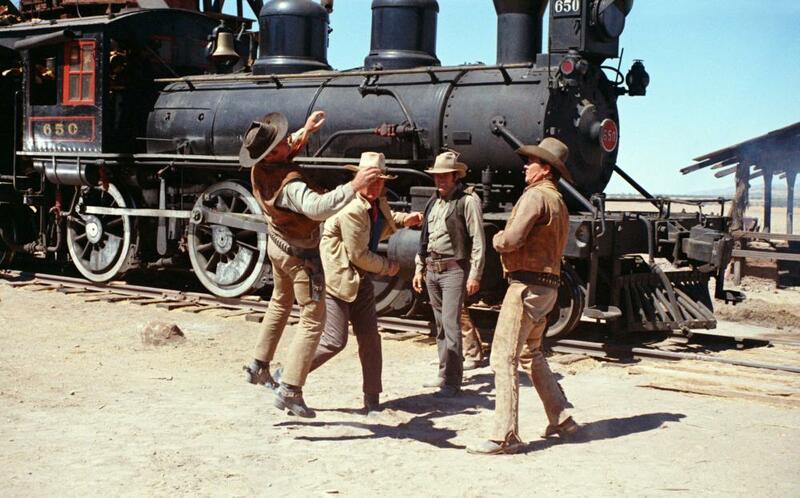 Director Taylor Hackford has commented that Scott’s Buchanan is a sort of precursor to Clint Eastwood’s Man With No Name, the character at the center of Sergio Leone’s influential Dollar movies. . 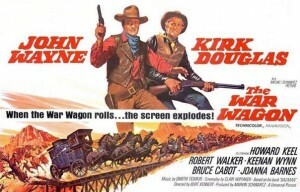 This entry was posted in Westerns Worth Watching and tagged Budd Boetticher, Burt Kennedy, Lucien Ballard, Randolph Scott, The Mysterious Stranger on February 6, 2014 by Nicholas Chennault. 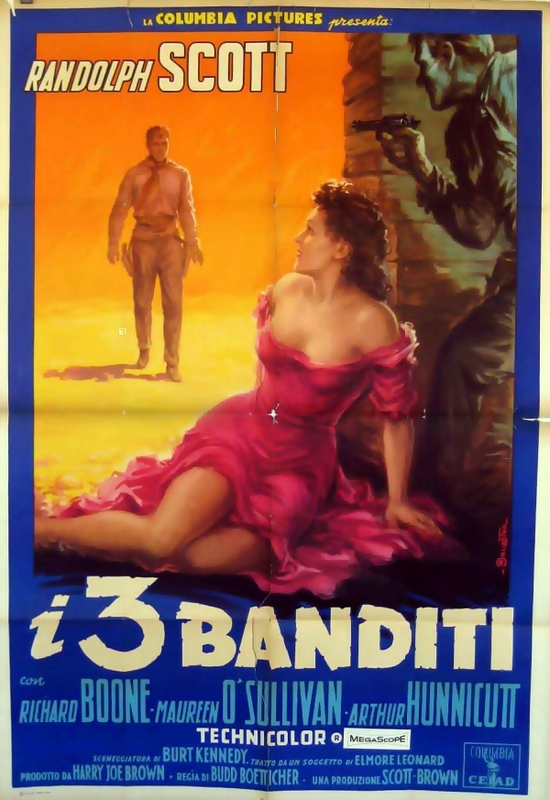 A variation on a theme of Hondo—remote ranch threatened by Indians, widow with young son befriended by capable scout who may have had something to do with her husband’s death. 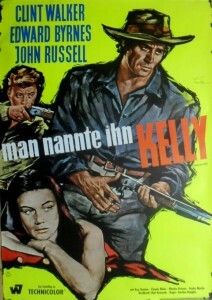 Apparently this was kind of a low-budget variation, with a couple of television actors starring. 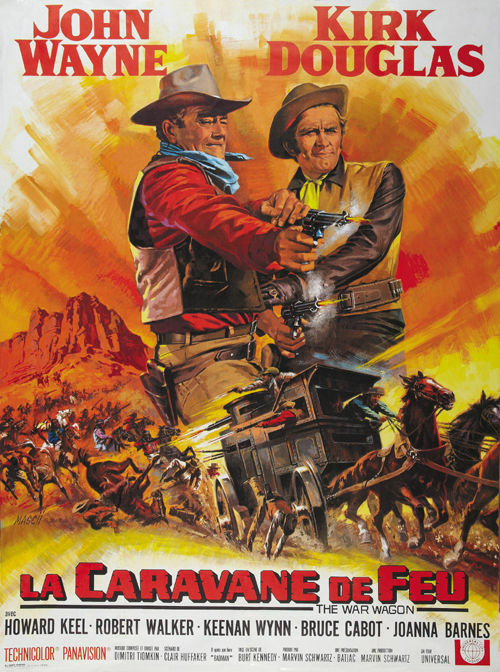 In black and white in 1958, filmed near Moab, Utah. Cinematography is by William Clothier. 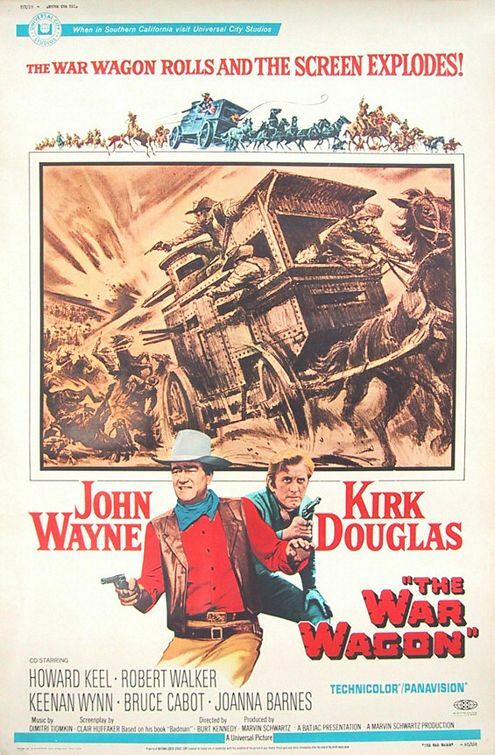 Written by George W. George and Burt Kennedy (screenwriter of the best Boetticher-Scott westerns), with music by Max Steiner. The original title was Fifteen Bullets to Fort Dobbs, shortened upon release to just Fort Dobbs. 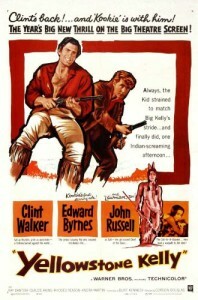 How much you like this western depends on your tolerance for Clint Walker’s brand of taciturn acting. 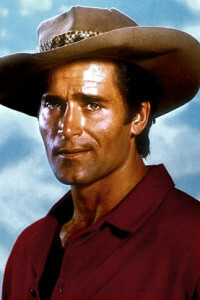 Walker is Gar Davis, big and good with a gun but not so good with women, apparently. 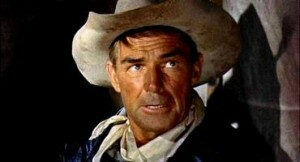 As the movie opens, he kills somebody and the sheriff from Largo (West Texas? New Mexico?) 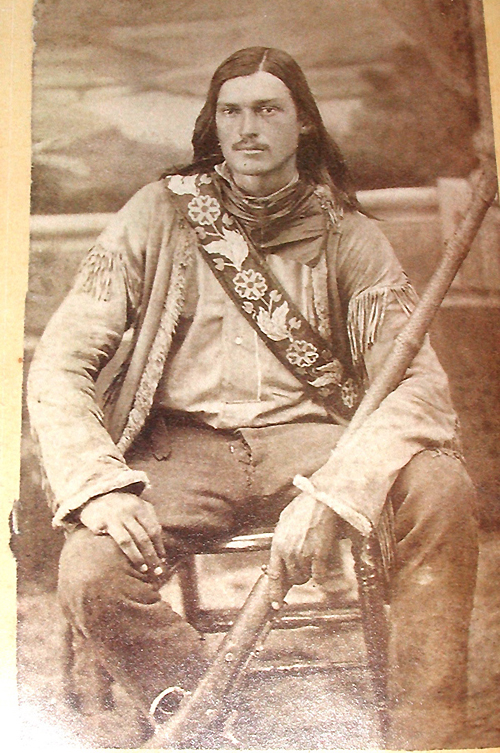 leads a posse after him into Comanche country. 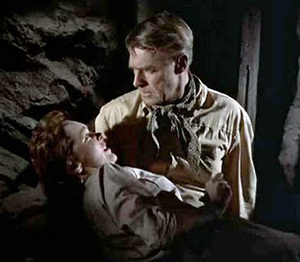 Davis finds a body with an arrow in the back; he switches jackets with the corpse and pushes it into a ravine, hoping that the posse will take it for him without getting close enough to get a better look. 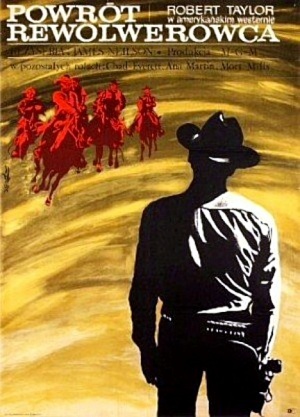 When the posse, already uncomfortable with chasing Davis, finds the body, they are only too willing to head back without investigating further, taking Davis’ horse. 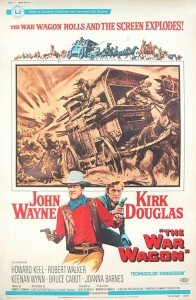 Davis finds a remote ranch and attempts to make off with a horse, only to be shot a glancing blow. 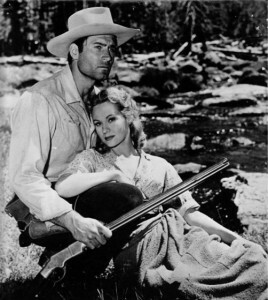 It turns out the ranch is owned by Mrs. Gray (Virginia Mayo, in one of her better roles) and her son Chad (Richard Eyer). 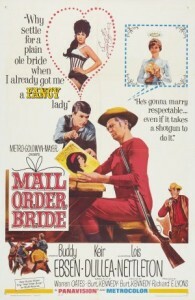 Gar Davis with Mrs. Gray, and an amusing exchange with Clett the gunrunner. It further turns out the corpse Davis had found was her husband, and she begins to think Davis killed him. Davis gets the widow and son out just as the Comanches torch the ranch, and they head for Fort Dobbs. 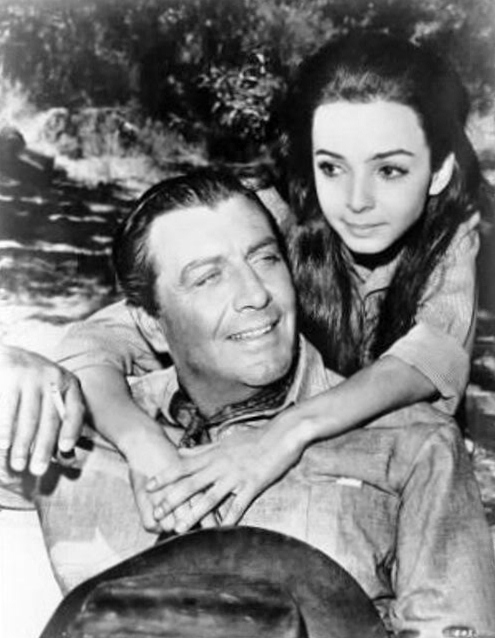 The trip is complicated by numerous Comanches, encounters with Clett, a garrulous and unscrupulous gun-runner (well-played by Brian Keith), and Mrs. Gray’s headstrong nature and suspicions of Davis. 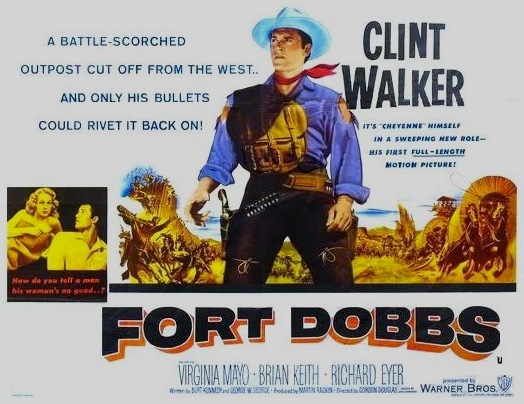 When they do make it to Fort Dobbs, they find the garrison has been massacred. Not far behind them are the survivors from Largo, led by the sheriff (Russ Conway), with Comanches in pursuit. 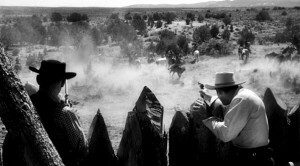 They’re running out of ammunition, and Davis volunteers to head for Santa Fe for help. By this time the sheriff has persuaded Mrs. Gray that Davis didn’t kill her husband, but he still intends to hang Davis for a killing back in Largo. He fills Mrs. Gray in on more of Davis’ background, and that his love for a faithless woman was at the root of his troubles with the law. 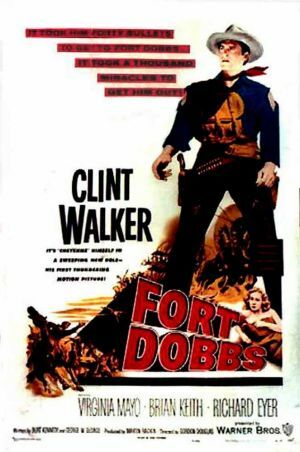 On his way to Santa Fe, Davis encounters Clett the gunrunner again and tries to persuade him to take the guns back to Fort Dobbs. They shoot it out, and Davis heads back with the guns—new Henry repeating rifles. Davis gets in just as the Comanches attack again, and the rifles enable the fort’s defenders to ward off the Indians. 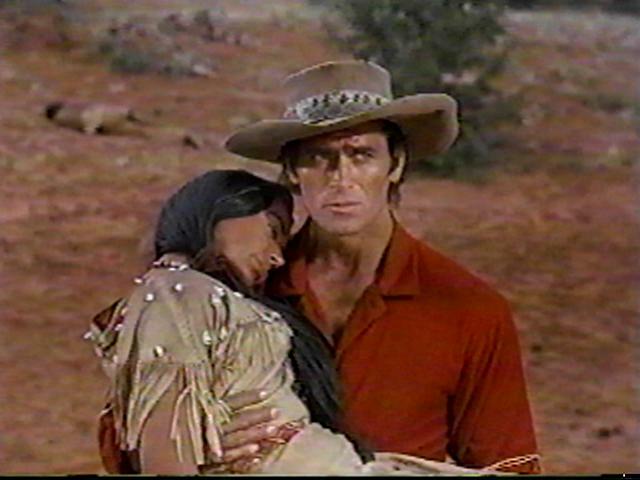 At the end, the sheriff sends Davis off to Santa Fe with the Grays, now that they’ve all forgiven him. This is quite watchable. 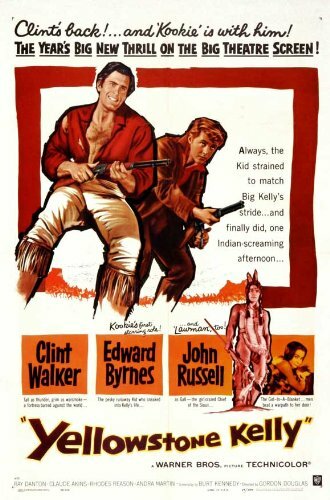 In fact, this is probably Clint Walker’s best western, not primarily because of his acting, which is pretty consistent from movie to movie, but because of the decent script and good supporting actors, especially Mayo and Keith. For Virginia Mayo in another good western, see her with Joel McCrea in Colorado Territory. Shot on location near Moab and Kanab, Utah, in black and white. 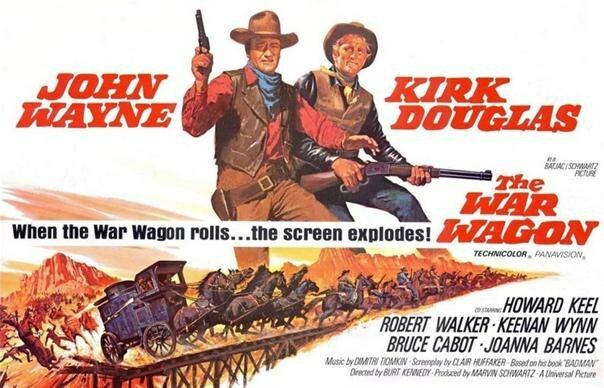 Douglas also directed the 1966 Stagecoach remake, Rio Conchos, Yellowstone Kelly, and Barquero along with more mainstream stuff like In Like Flint, Robin and the 7 Hoods, The Detective and They Call Me MISTER Tibbs. He’d been directing movies since 1935—kind of an Andre de Toth type. 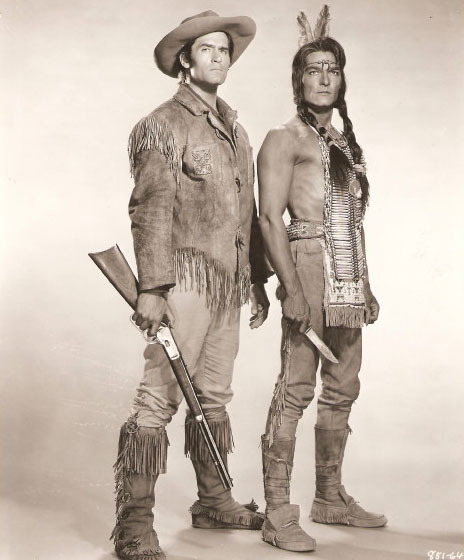 This entry was posted in Westerns Worth Watching and tagged Burt Kennedy, Clint Walker, Native Americans (Indians), Virginia Mayo on January 6, 2014 by Nicholas Chennault. 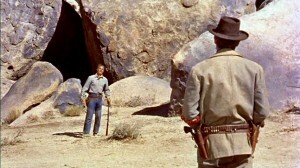 In the opening scene, former sheriff Ben Stride (Randolph Scott) enters a cave from a driving rain storm and approaches the campfire of two strangers. They’re a little edgy, and they start talking about a recent killing in the town of Silver Springs. 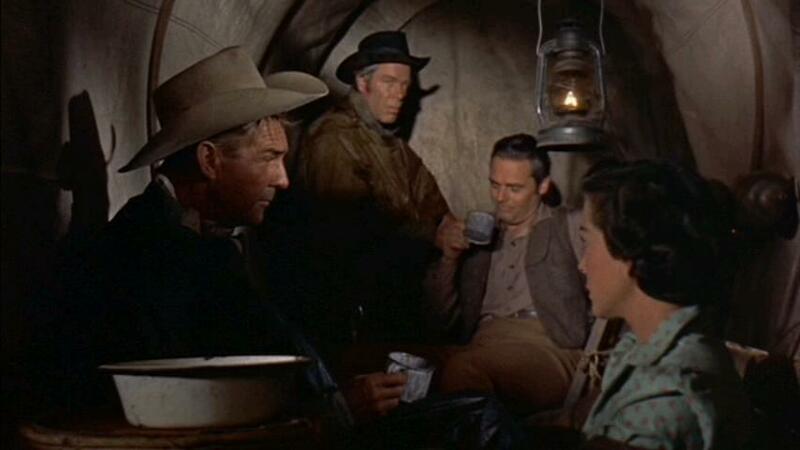 Stride sits at the fire and takes a cup of coffee. One of the two asks Stride, “Did they catch the ones who done it?” “Two of ‘em,” responds Stride, carefully watching the others. They draw and Stride gets them both. We don’t know why Stride was the one hunting them, but he walked right in and did it fair and square. And according to the title there are five more to come. Randolph Scott as Ben Stride, looking for seven men. On his way the next morning Stride crosses trails with the Greers, an eastern couple whose wagon is stuck in mud. 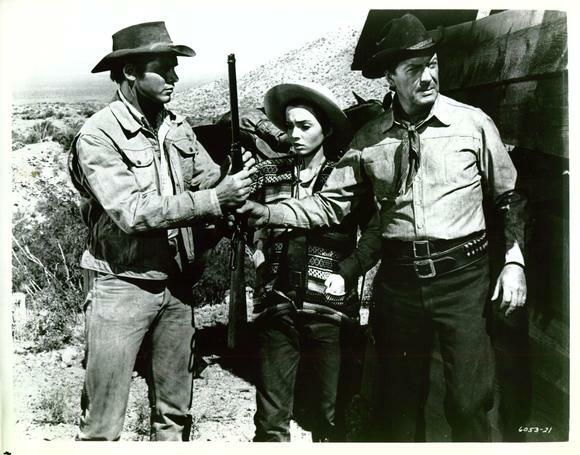 He helps them pull out and guides them to a deserted stage stop, where they encounter Bill Masters (Lee Marvin) and Clete (Don Barry). Masters is somebody Stride once put in jail, and who claims not to have been involved in the robbery in Silver Springs, although he’s interested in the stolen gold. 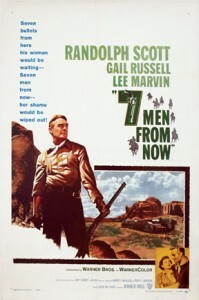 For a while the four travel together, and they rescue a man pursued by Apaches, only for Masters to kill him moments later as the rescued man tries to shoot Stride in the back. Three of seven down; four more to go. Masters has eyes for Annie Greer (Gail Russell), whose husband John (Walter Reed) is garrulous, unskilled in the ways of the west and perhaps weak. 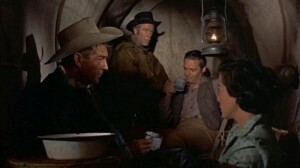 Masters pushes John Greer in a remarkable scene in a wagon in the rain just telling stories, until Stride makes Masters leave. Masters (Lee Marvin) telling tales in the rain. It turns out Stride is a widower; it was his wife working in the Wells Fargo office who was killed in Silver Springs. 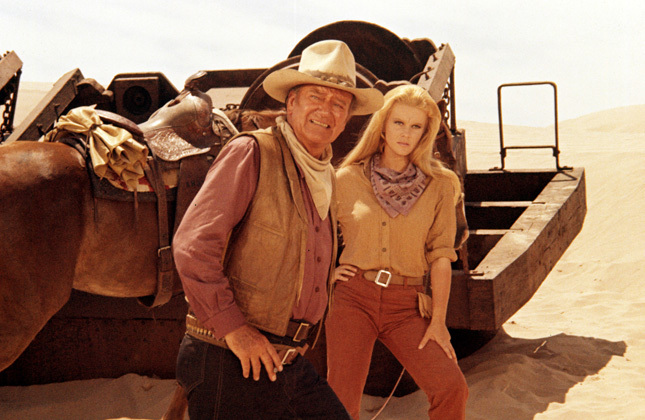 Stride lost the last election for sheriff, and when he declined to take a job as deputy, his wife had to work. He’s now attracted to Annie Greer, too, but she’s married and Stride has a strict moral code. Stride and Masters are both heading for Flora Vista, which they think is the likely point for whoever took the Wells Fargo gold to try to get it into Mexico. 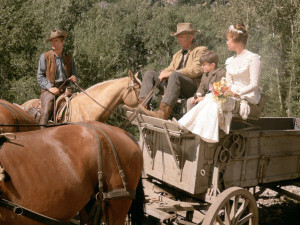 The Greers are going there to catch a trail west to California. Masters reaches Flora Vista first after leaving the slower-moving Greers, and there he encounters Payte Bodeen (John Larch), the leader of the gang that planned and committed the robbery and murder. Masters tells them Stride is on his way, and two of the gang are dispatched to intercept Stride in the desert before he gets to Flora Vista. Stride gets them both, but injures his leg and loses his horse in doing so. The Greers, following along behind in their wagon, find him and patch him up as well as they can. John Greer admits that he had unknowingly agreed to take the stolen Wells Fargo box to Flora Vista, and he leaves it in the desert with Stride. Stride figures it will draw the remaining killers to him. He’s right, and it also draws Masters and Clete. The final shootout for the gold is between Stride and Masters, and it’s great. By the end of the movie, John Greer is also dead, more bravely than one might have expected, and there is the suggestion that Stride and Annie Greer might get together. But they might not, too. That makes this movie one of only two (along with The Tall T) of the Boetticher westerns where Scott may end up with a romantic interest. An injured Ben Stride (Randolph Scott) faces off against Masters (Lee Marvin) in the desert. The editing of the shooting scenes is very interesting. Although Stride wins at least two of these, we never actually see him draw and shoot. We see Masters constantly playing with his guns, drawing them, loading them, twirling them, and he’s clearly fast, dextrous and confident. Fast as Masters is, Stride is faster, but it’s mostly in our minds. This is a remarkable contrast to how shootout scenes are shot in later westerns, especially after The Wild Bunch. Scott plays much the same character in all the Boetticher westerns—capable, taciturn, obsessed with vengeance, sure of himself and that he knows all the rules. Lee Marvin is one of the two best villains in a Boetticher movie, and although he is an obvious bad guy he’s not without a certain dangerous charm. 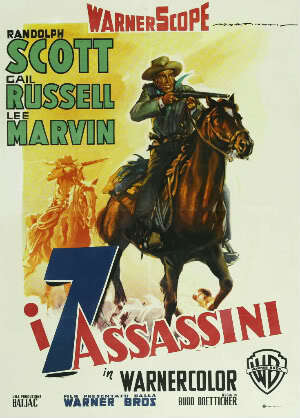 The interactions between Scott and Marvin make the movie memorable. 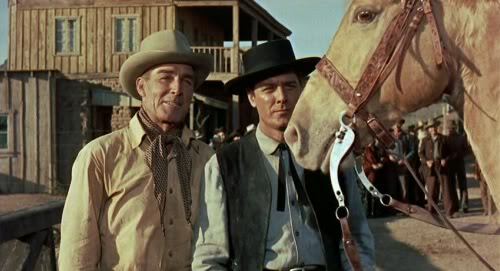 You can also see Scott’s frequent uncredited co-star, his beautiful dark palomino horse Stardust. 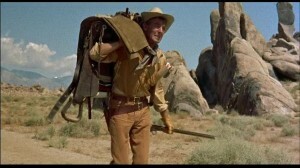 The script was written by Burt Kennedy for John Wayne, but Wayne couldn’t take the part of Ben Stride because he was scheduled to be in John Ford’s The Searchers. 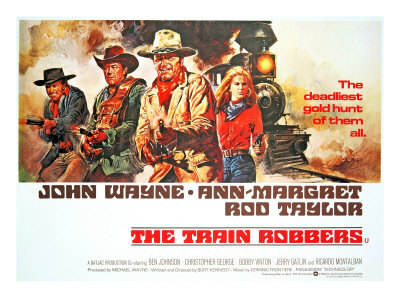 However, this one was produced by Wayne’s Batjac Company and was successful enough to start a series for director Boetticher. The rest were produced by Randolph Scott and Harry Joe Brown—combining their names in that of their production company, Ranown. 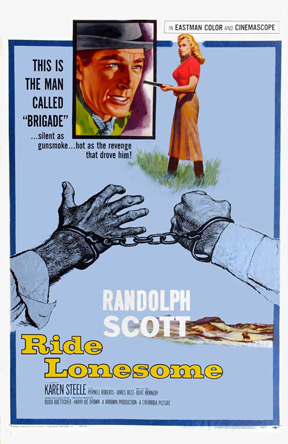 This is the earliest and one of the best of the westerns directed by Budd Boetticher and starring Randolph Scott, all made during a surprisingly brief period in the late 1950s. “Spare” is one word frequently used to describe the storytelling in them. They typically don’t have large casts or budgets, and they’re not long, but they work well. Burt Kennedy wrote this one, as he did the best of these collaborations. 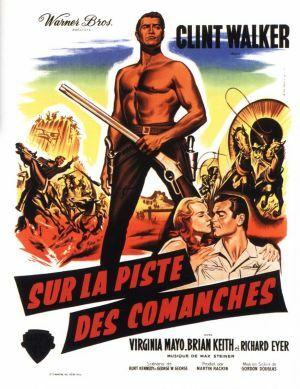 This and the other Boetticher westerns were unavailable for decades, appreciated only by a small cult of fans and, of course, the French. But you can now find them on DVD, and they’re well worth watching, especially the stronger entries in the series (The Tall T, Ride Lonesome and Comanche Station). 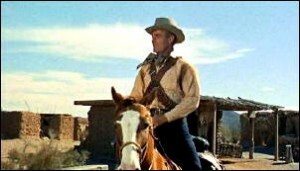 This entry was posted in 55 Greatest Westerns and tagged Budd Boetticher, Burt Kennedy, Lee Marvin, Randolph Scott on September 14, 2013 by Nicholas Chennault.